The second Greg Mandel novel is “A Quantum Murder”. As the title indicates, this is a murder mystery with Mandel called in to investigate the brutal slaying of a brilliant but reclusive physicist. Because the physicist - one of the pre-eminent scientists of his time – worked for the company owned by Julia Evans, she asks her friend Greg to investigate the case, since the local police are stumped by the bizarre murder. There are no shortage of motives, in addition to corporate rivals looking to kill one of Evans' company's best researchers, the physicist shared his home with a small number of highly gifted physics students – several of whom had a potential motive to kill him, although none of them seem capable of such a brutal killing. Needless to say, there are plenty of twists in the tale that Greg will have to unravel. The science fiction content in this novel is fairly slight, mainly concentrating on the physicist's vaguely described efforts to use quantum mechanics to use wormholes to travel or communicate through space or time. Inevitably, the consequences of this technology are key to the events surrounding the murder. The Science Fiction content does provide a bit of a twist on the typical detective novel, allowing the detective a few extra tools that aren’t present in a typical murder mystery. Some of the technology does also allow the slightly unlikely shoot-out that forms the book’s climax. As in the first book the characterisation is strong, both the returning characters (principally Greg himself, although several others reappear from the previous book) and the new characters in the form of the physicist’s students. The murderer’s motivation is also plausible although the murderer does make a slightly bland villain once revealed. The plot is quite fun, it may be a reasonably standard detective story but it is also a well-executed one. 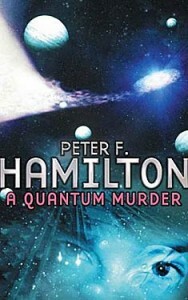 “A Quantum Murder” isn't the finest book Hamilton has ever written, but it is entertaining. Although it lacks in ambition it is a competently executed plot and works well as a murder mystery.